This entry was posted on March 5, 2013, in Learning to Swim, Swim Heroes, USMS and tagged Amherst Masters Swimming, Bob Newcomb, New England Masters, Russ Yarworth, UMAMA, USMS in Western Massachusetts. Bookmark the permalink. To anyone who knows me, it’s no secret that I have a bit of an addiction to my Masters swim team and a total swim crush on my coaches who have, quite literally, changed my life. In case you are not familiar with Masters, it doesn’t mean you have to be a MASTER swimmer. Basically, it means you are an adult, over 18, who wants to swim with a group, using coached workouts and in the case of my particular team, fantastic guidance from Russ Yarworth, Head Coach of the Men’s Swimming and Diving Team at UMASS, and Bob Newcomb, Women’s Swimming and Diving Coach at UMASS. Yes, UMAMA is lucky enough to be coached by two stellar and award winning coaches. For some, private instruction is not what they need or desire. Yes, they want the guidance and tutelage of a coach but not in the one-on-one setting I provide at Swimcrest. Some want the regularity of consistent and challenging workouts, geared toward their level, available several times a week. 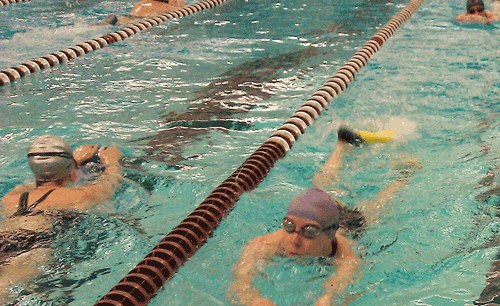 For that swimmer, Masters swimming might be the perfect option. But Masters is much more than just a place to swim. For me, UMAMA has become a community, a group of friends and fellow addicts I couldn’t imagine being without. In many ways, swimming is a solitary sport. Sensory deprivation aside, it’s not a team endeavor in the same way of basketball or soccer. It’s a sport you can do completely alone. To have a group of people who share your interest, who wish to continue learning and growing in their chosen sport, and who swim for all kinds of reasons is something to be cherished. We have swimmers who compete regularly and swimmers who have never competed. We have people who only swim, and people who swim and run and bike and ski and do a variety of other sports. We have swimmers who LOVE open water and swimmers who would never swim without that line to follow. Here are the basic details of UMAMA. UMAMA is a registered workout group of New England Master’s Swimming www.usms.org. Our membership is comprised of some former competitive college and club swimmers, triathletes, and fitness swimmers. We encourage a friendly training atmosphere and provide coached practices three days per week. We try to keep the workouts at the level appropriate for each individual. We also allow potential new members to come and observe or try out a practice by arrangement with the coaches. We have no competition requirements although many of our members participate in USMS Swim Meets, Triathlons, and Open Water events…You need not be affiliated with UMass to join our program. The cost is $60 per month for a full membership and $30/month for 6 or less practices during that month. We also require US Masters Swimming membership ($42/year) for insurance purposes. You can register with New England Masters here. One way or another, I hope to see you in the water soon! « My Superhero Dreams Made Real!